Gilford Old Home Day 2005 was a resounding success for the Thompson-Ames Historical Society. There were more demonstrations and volunteers than ever, which made this year's Old Home Day by far our most successful! 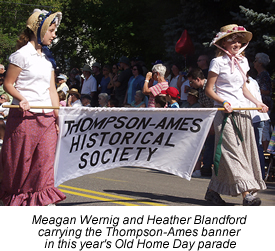 With this year's parade entry, the Thompson-Ames Historical Society made a return to the Old Home Day parade after an absence of many years. The historical society is extremely grateful to all those volunteers who worked so hard to make this entry possible. The theme, "Gilford: A Town for All Seasons", made T-AHS realize that the historical society has many items that could be represented by an entry into the parade. A committee was formed and co-chairs Carol Anderson, Carolyn Brown, and Diane Mitton went right to work. T-AHS board members, Mary Chesebrough and Carol Anderson created a black and white name banner which was carried by Heather Blanchard and Megan Warnig. Both of these young ladies were dressed in long skirts made by Carole Johnson. Heather and Megan also modeled old-fashioned straw bonnets, carefully handmade and decorated by the wonderful artist, Susan Percy MacDonald. Carolyn Brown was perfectly dressed to represent winter, not an easy task on a hot summer day. Carolyn was dressed in a ski hat, long-sleeved shirt with a red scarf, corduroy knickers, wool knee socks and leather boots. Vintage wooden skis and ski poles were taken from the collection of T-AHS to complete Carolyn's outfit. To represent spring and the sugaring season, Diane Mitton wore a smocked shirt and tasseled woolen hat and carried on her shoulders an antique wooden yoke. Hanging from either side of this yoke were metal sap buckets. Summer was proudly portrayed by Ashley Hewitt and Katie McCutchen who wore long skirts and sunbonnets again made by Carole Johnson. Ashley carried a box of flowers which looked like a miniature flower garden. Katie pretended to water this garden with an old-style watering can. Carol Anderson and her children, Sarah and Dean dressed for fall. Carol and Sarah, both dressed in 1800's prairie outfits made by Carol, carried harvest baskets filled with some of Gilford's most beloved crops: apples, pumpkins and corn. Dean Anderson was a real crowd-pleaser, dressed in pants with suspenders, straw hat, and, hanging from his bamboo fishing pole, was an over-sized fish which was a gift from his grandmother. Sue and Pete Allen's grandchildren, Emily and Danielle, also pleased the young-at-heart in the crowd by handing out candy as they strolled along dressed in mob caps and long skirts. The last part of T-AHS' entry was made possible by the efforts of Rick Moses. Rick and his wife, Connie, had a very, very busy week at their farm due to the midnight arrival of their brand new colt, Glendale (congratulations to Connie and Rick!). Since Rick's horses were busy with Glendale and were not used in the parade, Rick graciously offered to pull his 1935 Garwood wooden boat. Perched high atop the parade in this antique boat was Gerald Knight's grandson, Jonathan. Jonathan, dressed like Huckleberry Finn, represented the wonderful fishing that is available in so many places in Gilford. Hanging from the side of Rick's boat was a sign which read: "Spring, summer, fall..boating says it all." "Fishing from a l935 Garwood beats fishing from a raft any day!" Signed: Huck Finn. Not only was the T-AHS parade entry a success due to the efforts of so many volunteers; so, too, were the demonstrations and open houses that occurred at all three of the historical society's three buildings: the Mt. Belknap Grange, the Union Meetinghouse and the Benjamin Rowe House. Thompson-Ames Historical Society wishes to thank the countless volunteers who gave demonstrations and who gave tours through these historic buildings. We could not function without all the talented volunteers who so willingly give us their time. The historical society received an overwhelmingly positive response during this Old Home Day from not only Gilford residents, but from many out-of-state visitors. Volunteers are already busy planning for next year' s Old Home Day. Anyone wishing to help out on Old Home Day or throughout the year should contact the Thompson-Ames Historical Society at 527-9009, or visit our website at www.gilfordhistoricalsociety.org If you are not already on the T-AHS mailing/e-mail list, do let us know your name and address as well as your e-mail address and you will be included. Feel free to e-mail the historical society at thomames@worldpath.net or stop by and visit us when the open flag is flying outside the Grange building, located at 8 Belknap Mountain Road in Gilford Village. Visitors and volunteers are always most welcome!